Expectations were high for our family trip to Arctic Sweden. With a five and three year old about to embark on their first flight….first time to the Arctic….first time in waist high snow….first time sledding with huskies….first time to see the northern lights….the list of ‘firsts’ goes on and on and their excitement knew no bounds. As a sensible travel professional and as a Mum I did my best to manage their expectations and ensure the reality of this family friendly holiday would be fun and exciting – with or without the northern lights. I need not have worried. The flight from Gatwick to Kiruna via Stockholm passed quickly without delay or incident- tantrum or otherwise, and after a scenic two our drive (with Harriet asleep safely tucked in her car seat) we arrived at Bjorkliden…a tiny mountainside resort overlooking frozen Lake Torneträsk and the majestic Lapporten mountain range. Our host Katie ushered us inside away from the cold to a cosy reception and lounge area with open fire and comfy chairs with a small, traditional, ski resort feel. The sun had set by the time we arrived but we got a sense from the large expanse of windows that something special awaited outside, but had to wait until the next day to see for ourselves. Next morning our suspicions were confirmed as we took in the breathtaking views from the lounge and restaurant over breakfast and morning coffee. We were given our key and asked if we would like to give our mobile number so they could send us a text whenever the northern lights appeared during our stay (fantastic service as we didn’t have to wake-up periodically to make sure we weren’t missing them!). The first text wasn’t needed though…as we ate dinner not half an hour later a bright squidgy ball of green hovering in the dark sky was clearly visible from the restaurant window….I’m not sure who was more surprised, my elated husband and children or me! After dinner and time for the children to explore the well-equipped play room (small, cosy, lots of toys, paper, crayons, dvd’s) right next to reception we headed to our cabin. Our Kappas cabin was a 5 minute walk away with a large and private north facing balcony ready for enjoying the northern lights should they appear. William our eldest was most excited about bagging the top bunk and the fact we had our own sauna in the cabin. The cabin was warm and welcoming with one double room and one room with bunk beds, as well as a lounge, kitchenette, bathroom and lovely sauna! Next morning once we managed to stop staring at the stunning vistas from the restaurant – wow – we enjoyed a hearty breakfast and got ready for our first Arctic adventure, with a bunch of eager huskies. After a short 5 minute ride down to the lake we togged up in more warm gear and met our local guides and the friendly dozen huskies that were our transport and companions for the next few hours. Our children loved helping to unload and harness the dogs, hearing their names and getting excited along with the dogs as the barking and howling escalated. Then we were off and my husband and kids were surprised by the quietness as soon as we were on the move. The dogs were happy doing what they loved best and we sat back to enjoy them and the scenery and wildlife all around. After an hour long sled ride this short adventure came to an end – a perfect introduction to dog sledding for our family…with more to come very soon. Our afternoon was filled with great tobogganing in the glorious winter sunshine. The gentle slopes were perfect with lots of off-piste options for the more adventurous tobogganer (ie not my daughter and I…one head plant in the snow and she was ready for a hot chocolate and play in the playroom to recover). They made friends with a few other children, despite the language barrier, but it didn’t feel like a resort just for families – it was a good mix of families and adult couples / groups of friends. After a tasty dinner of locally inspired and tasty food (we had Carpaccio of reindeer with lovely herb accompaniment followed by Elk steak and potato wedges – there was a simple children’s menu and all special diets can be catered for), a sauna in our cabin rounded off the day nicely (our children loved it for novelty value but lasted no longer than about 5 mins!) The children fell to sleep in record time and we spent the rest of the evening supping wine with frequent stints on the balcony watching the northern lights (not quite so strong but definitely there). Happy days. In wintertime you can enjoy snow shoeing and skiing downhill here too (from February to April). For those inclined to you can cover 5 mountains and 10,000 metres altitude in one day. There are five ski lifts, including two for children and there’s a popular children’s ski school from Feb-April too. Northern Lights Lavvu Experience by snowshoe to a traditional Sámi lavvu situated in the mountains – the perfect place from which to search for the Northern Lights! Ice Fishing. Arctic char is the crown jewel of all the fishes in the Arctic. It is a tricky one to catch but when it strikes, it is a true fighter! The famous Aurora Sky Station at Abisko - a perfect place to watch the Northern Lights with a large deck looking right up at the dark sky. Ice Climbing on the frozen waterfalls surrounding Bjorkliden is a wonderful experience and suitable for beginners. Arctic Wilderness Introduction with an experienced guide learn the basics for outdoor living during winter such as how to make a base camp & fire and get drinking water in Arctic conditions. A fun activity for the whole family. An exhilarating journey by snowcat or snowmobile with sled up to Sweden's highest mountain station, Låktatjåkko. A true must for everyone who visits after mid-February when its possible to reach – the views and the waffles are amazing! A reindeer and Sami experience to a Sámi village nearby. So, that final surprise – a visit and tour of the world’s first Ice hotel en-route to the airport. My daughter wondered if Elsa would be there (all parents of young children will know about the insanely popular Disney film ‘Frozen’) but she wasn’t deterred when she was not! We were shown around the ice suites, ice chapel and ice bar by a friendly guide and starred in awe and wonder at the amazing sculptures carved each year from tonnes of ‘snice’ (snow and ice) by renowned artists from around the world. An ‘Elephant in the room’ was the children’s favourite while my husband and I loved watching them play hide and seek in one cavernous suite. A fitting end to a magical Arctic family adventure. Will we be back some day…you bet! 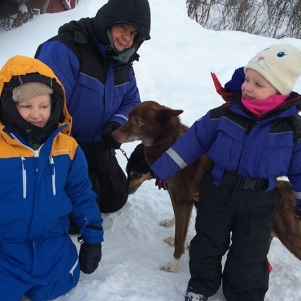 If you're interested in a fun family adventure in Swedish Lapland get in touch with the team at Magnetic North Travel who will make it happen for you.